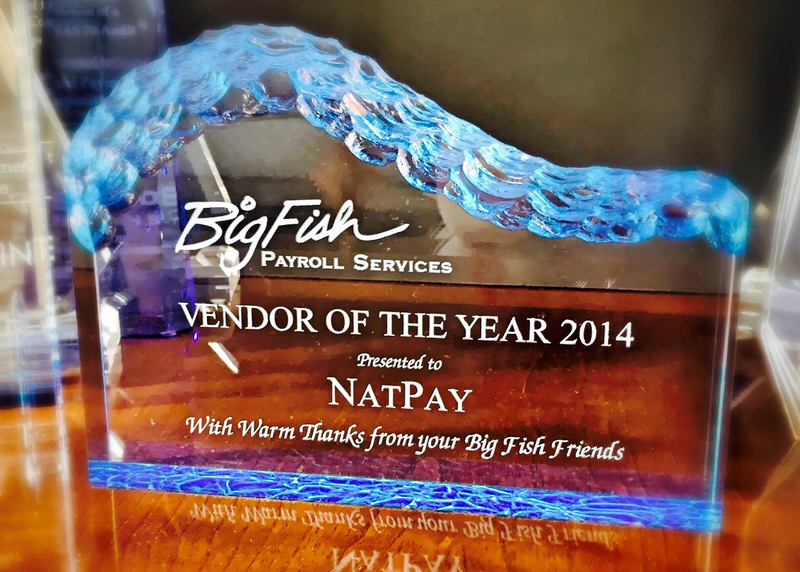 December 22, 2014 – Each year Big Fish Payroll Services selects one vendor that they work with as their vendor of the year. For 2014, Big Fish has selected NatPay. Avail Professional Services in Sorento, IL. d/b/a Apex Payroll, provides payroll services, bookkeeping services and income tax return preparation to individuals and corporations. They are a small business that specializes in serving other small businesses. Avail wanted to offer their clients a turn-key, dependable direct deposit service and chose NatPay for several reasons. NatPay is known in the industry as a reliable and trusted ACH service provider and has a unique system for adding clients in order to provide processing for payroll clients quickly and efficiently. “We had a new client that required a quick turnaround set up time. A NatPay technical support representative was able to get the client set up the same day,” remarked Amanda J Dussold, CPA. A key differentiator of NatPay’s ACH Solutions is that the company provides extended processing time for payroll processors across the nation, allowing for west coast clients to process throughout their business day – the same as an east coast client would. “When I was having problems with the file “after hours” – I called approximately 7:30 eastern time – customer service was available to help”, stated Dussold. NatPay is the only ACH Service Provider that is open from 9am to 10pm ET to accommodate file uploads throughout the work day regardless of their location. This is a tremendous benefit to payroll professionals across the nation – especially those who send files several times a day and after many banks and ACH processors have already closed. Jim Hagen, VP of Sales for NatPay commented that many clients find their way to NatPay simply because of excellent customer service. “It’s a competitive industry and to not offer a quality service or a dependable service – you won’t stay in this business for long.” Other issues that Avail was concerned with in selecting a direct deposit service provider was implementation time and customer support. “One of the reasons for selecting NatPay was the helpful staff and good customer service”, Dussold said. Timing options were also a factor in selecting NatPay as a ACH service provider (2 day processing, etc.) Being able to process payroll with faster processing. NatPay provides flexible timing options that help payroll professionals work smarter and faster – providing a service that many banks and ACH providers simply cannot match. TESTIMONIAL: Many thanks to Jonathan and Elissa for helping me solve my payroll problem. Many thanks to Jonathan and Elissa for helping me solve my payroll problem. Your diagnosis and familiarity with DacEasy and NatPay pointed me in the right direction so that I was able to finish the payroll long before midnight! TESTIMONIAL: I LOVE LOVE the updated withdrawal descriptions for my customer accounts! I just wanted to tell you how much I LOVE LOVE the updated withdrawal descriptions for my customer accounts! Now that custom preferences allow for matching descriptions, it makes our life and our client’s lives much easier. After using DPS and others in the past, NatPay is easily the best! You’ve got a great system and I’m VERY happy with it. – Tracy Biesecker, Director of Financial Services and AOD User, Cross Keys Village – an organization that provides unmatched services to those seeking retirement living, personal care, nursing care, and adult day care. – Written on behalf of Jody Eccleston, Finance Director of Community Ministries of Rockville – an organization that seeks to improve the quality of life for the most vulnerable of Montgomery County residents by (1) providing basic services including housing, healthcare, homecare, education, and emergency assistance, with the goal of achieving and maintaining client self-sufficiency, and (2) advocating on their behalf. Doculivery Testimonial from Reilly Electrical Contractors, Inc.
Lisa Walsh – Herbert, Rowland & Grubic, Inc.
Online Pay Stubs Testimonial from Retail Construction Services, Inc.